Living Torah distills the Rebbe’s teachings, presenting them in a format accessible to scholar and novice alike. 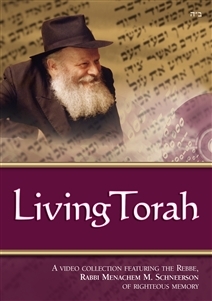 Using subtitles to translate the Rebbe’s talks, and optional narrations for the children, the Torah segment gives a taste of the thrilling experience of learning Torah directly from the Rebbe himself. The additional segments reveal a glimpse into life at “770,” as well as one-on-one conversations with this great Jewish leader. A new volume is released every four weeks! Copyright © 2014 Jewish Educational Media. All Rights Reserved.